This small MetroPark provides an unobstructed and picturesque view of the downtown Dayton skyline, embraced by the beauty of nature. It’s the perfect spot to unwind at the end of the day, watching the sunset over the city on one of the park’s swings or benches amidst floral displays. It’s also the best place to catch the giant RiverScape Fountains of Light between Memorial Day and Labor Day. Located at the convergence of the Great Miami and Mad Rivers and the paved trails that run along them, the park is a scenic and popular stop for runners, cyclists and paddlers — not to mention local wildlife. There is 24 hour access to this park, 365 days a year. Dogs are welcome, but, for the safety and comfort of all patrons, they must be leashed and under control at all times. The Deeds Point Dog Park is conveniently located adjacent to the park. The Buckeye and North Country Trails pass through Deeds Point. This section of the Buckeye Trail is part of a 1,440-mile continuous loop that encircles Ohio. The North Country National Scenic Trail stretches across seven states and will be 4,600 miles long when completed. These trails provide long-distance hiking combined with links to access historical and scenic features. Deeds Point features Legacy Plaza, an aviation heritage site. The Plaza includes two life-sized statues of Dayton’s own Wright Brothers that commemorate the very beginnings of aircraft control. The statue captures Orville twisting a bicycle inner tube box as Wilbur explains his scheme for warping wings. There is also an aviation timeline exhibit that serves as an ongoing reminder of the importance of the Wright Brothers and Dayton to aviation history. The paved Great Miami River Trail runs through the park and connects to the region’s network of more than 330 miles, the nation’s largest paved trail network. Deeds Point offers a great place to stop, with drinking water, benches and swings. Learn more about the Great Miami River Trail. The park has a Peace Pole monument that symbolizes the agreement for peace between Bosnia and Herzegovina reached in Dayton on November 21, 1995. It was erected in 2003 by The Friendship Force of Dayton. At the center of Deeds Point sits a large grassy circle perfect for sunrise salutations. With a great skyline view, this best-kept secret is easily accessible by bike or foot on the Great Miami River Trail, or by car from Webster Street. The landscape beds line the park, conveying hints of a floral garden paradise. All amenities of the park are accessible, including parking areas. There are no restrooms at this facility. The ADA-accessible drinking fountain is dog-friendly and is located on the northeast end of the park along the roadside. Deeds Point MetroPark has a bronze statue of Wilbur and Orville Wright as a fixture along the Great Miami River Trail and an aviation timeline exhibit that serves as an ongoing reminder of the importance of the Wright Brothers and Dayton to aviation history. The park also has a monument — Dayton Peace Accord — that symbolizes the agreement for peace between Bosnia and Herzegovina reached in Dayton, Ohio, on November 21, 1995. Take Route 17 north on Main Street through downtown. This route will pass Deeds Point MetroPark on Webster Street. The park is accessible by foot or bike on the Great Miami River Trail. The location of this park, at the convergence of the Great Miami and Mad Rivers, draws visitors to the water and provides an opportunity to interpret and enhance public perceptions of the cleanliness, health and species diversity of our waterways. The rivers are an excellent place to see the bald eagles that have recently made a return to the Miami Valley, and potentially black-crowned night heron, a state-listed threatened species. Black-crowned night herons frequent Island MetroPark just upstream, where conservation staff and volunteers have been building a habitat for them. The park’s native plantings benefit pollinators looking for a nectar source. 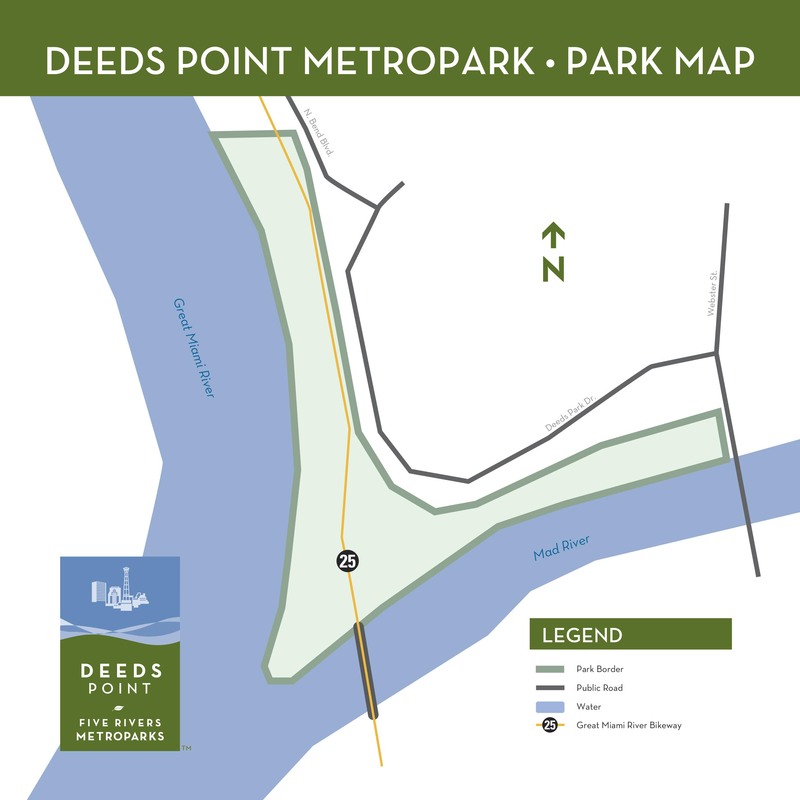 Deeds Point sits just across the river from RiverScape MetroPark at the junction of the nation’s largest paved trail network and the on-street facilities in downtown Dayton. The Great Miami River Trail that runs through Deeds Point connects to Island MetroPark to the north and the Mad River Trail to the south, taking riders to Eastwood and Huffman. The Great Miami River that converges with the Mad River in the park is an excellent warm water species fishery with smallmouth and largemouth bass, panfish and catfish. The paved trails that traverse the park make Deeds Point a popular spot for runners, inline skaters, walkers and cyclists. At the center of Deeds Point sits a large grassy circle perfect for sun salutations. Deeds Point was named after Colonel Edward Deeds, a Dayton inventor and businessman who helped rebuild Dayton after the 1913 flood. He was instrumental in forming the Miami Conservancy District and served as its chairman until 1954. The park has a bronze statue of Wilbur and Orville Wright and an aviation timeline exhibit that serves as an ongoing reminder of the importance of the Wright Brothers and Dayton to aviation history. The park also has a monument — Dayton Peace Accord — that symbolizes the agreement for peace between Bosnia and Herzegovina reached in Dayton, Ohio, on November 21, 1995. Deeds Point MetroPark lies at the junction of the Mad and Great Miami rivers. A variety of migratory and resident birds can be seen here. This small MetroPark provides the most picturesque landscape and view of the city of Dayton from a west to southwest viewing angle – the perfect spot for skyline sunsets. Catch the best views of RiverScape Fountains of Lights from Memorial Day to Labor Day. Commercial photography permits are required.